What Can Timothy Geithner Do for Brown? 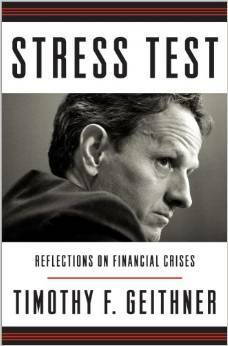 Not much, to judge from the former Treasury secretary’s new book, Stress Test: Reflections on Financial Crises. “Dealing with Congress, to put it mildly, did not feel like a careful, deliberative journey in search of the best public policy. I remember going to meet the personable Senator Brown [R-Mass., now running for Senate in N.H.], who had recently arrived in Washington after a campaign spent attacking the ‘Cornhusker Kickback’ … We talked about our kids and about triathlons. In Tuesday’s Boston Globe, Matt Viser provided the answer. The companies, Brown’s aide said, were Fidelity and State Street. Viser’s piece also details Geithner’s fraught dealings with Brown’s polar opposite, Massachusetts Sen. Elizabeth Warren (D-Ragged Edge of the Middle Class). Neither Brown nor Warren responded to the Globe’s request for comment. Huh. Silence may be golden, but it won’t pay the rent for either of those turtles. This entry was posted in Uncategorized and tagged Boston Globe, Cornhusker Kickback, D-Ragged Edge of the Middle Class, Elizabeth Warren, Matt Viser, Politico Playbook, Scott Brown, Stress Test, Timothy Geithner, Volcker rule. Bookmark the permalink. 2 Responses to What Can Timothy Geithner Do for Brown? The one who knows nothing and the one who knows too much?